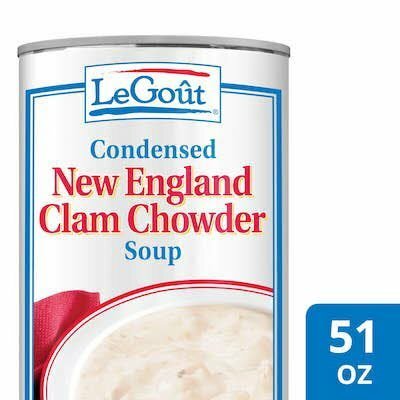 Made with a generous quantity of clams and potatoes in a creamy broth, rich in clam flavor. WATER, CLAMS, POTATOES, WHEAT FLOUR, SOYBEAN OIL, SALT, SUGAR, MODIFIED FOOD STARCH, DEHYDRATED ONIONS, SOYBEAN LECITHIN, SPICES, NATURAL FLAVORS. HEATING DIRECTIONS: Pour contents of this can into a double boiler and slowly blend in 1 can of whole milk. Heat to serving temperature, stirring occasionally. Do not boil. For best results maintain proper serving temperature of 160° to 180°F. YIELD: 12-8 oz. servings. Great tasting, savory soups with exceptional versatility, convenience and cost efficiency. Large cuts of meat, vegetables pasta and select seasonings. Easy to prepare - just add milk or water. Excellent served as finished soups or as ingredients in recipes.